Fourteen snake species are native to Massachusetts. Most are harmless and relatively small. Many barely reach 3 feet in length, while others don't reach 12 inches. Their habitats run the gamut from suburban backyards, woodlands, wetlands, farmland and the remaining wild areas of the state. Only two venomous snakes live in the Bay State: the timber rattlesnake and the northern copperhead. Both live in rocky, forested, isolated areas and are rarely seen by humans. They're protected under the federal Endangered Species Act. The timber rattlesnake's body varies in color, with shades ranging from yellow to brown, gray or black. The timber rattler boasts V-shaped crossbands along the back, with a rattle on the end of his dark tail. The snake matures between 36 and 60 inches. The northern copperhead's body is pink to gray-brown, with narrow brown or red crossbands on the back and wider bands on the sides. The crossbands on the back usually have small dark spots between them. The head is orange, rust, or copper. The northern copperhead ranges in size from 24 to 36 inches. The harmless and common eastern milk snake shares some of the bold patterns of the venomous types. People unfamiliar with this primarily nocturnal rodent consumer might mistake it for the copperhead and kill it, even though killing a copperhead is illegal. An easy way to tell the difference is to check the head -- the copperhead has no stripes there, while the eastern milk snake does. The milk snake matures between 24 to 36 inches. 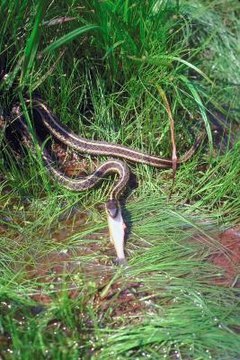 The common garter snake, maturing between 18 and 26 inches long, is easily recognized by the yellow stripes on a dark body. You can find these snakes just about anywhere that worms and amphibians, their favorite meals, exist. Northern water snakes are found -- you guessed it -- in or near the water. Their habitats include rivers, lakes, streams and wetland areas, where they dine on fish and tadpoles. Ranging in size from 22 to 42 inches, these thick snakes have black, brown or red crossbands by their heads and, further down, alternating spots on their sides and backs. They're sometimes mistaken for water moccasins, which don't live in Massachusetts. Although common, the small ringneck snake is seldom seen. Maturing between 10 and 15 inches, this black snake is easily identified by a yellow neck band. Feasting on bugs, salamanders and worms, ringnecks usually live in wet, wooded areas. The large black racer, a giant by the standards of most other Bay State snakes at 36 to 60 inches, is dark with smooth scales. Parts of the head and throat are white. Found all over the state, in many habitats, the black racer eats small mammals, insect and other snakes, including his own young.